There is now a reflector group for V/U/SHF sked alignment especially during contest operation. You find this on DCS001 reflector module U. Thanks to DG1HT ! I will be qrv in this module during July V/U/SHF contest from JO60LK. During V/U/SHF contests we use the logging software VUSC from OK1DIX. Is is a multi-operator network based log designed for contest operation. Since my last windows installation got destroyed by a stupid trojan i decided not to install windows anymore. So i tried VUSC under the Wine API emulator and it works very well. Please refer to the manual from Lada to see how it works. VUSC features some very good SSB and CW contest keyer. In order to use this with Wine you need to do some adjustments. You need a serial port with access out of Wine. I use a USB-serial converter for example. This shows up as /dev/ttyUSB0. Now create a symlink in the directory /home//.wine/dosdevices with the command “ln -s /dev/ttyUSB0 com1”. This makes a reference for Wine that it should refer to ttyUSB0 if com1 is selected. Take care that your user is in the group “dialout” in order to access the serial port. Now you may do some settings to select the correct pins and ports for PTT and Key. A paddle that is connected to the paddle input pins can be used together with the keyer functionality of VUSC. This works very well. But first try to get the PTT keyed if you press F1 in mode SSB and CW. One thing you might experience is that the CW keying is weird and the timing of the dashes and dots is completely rubbish. 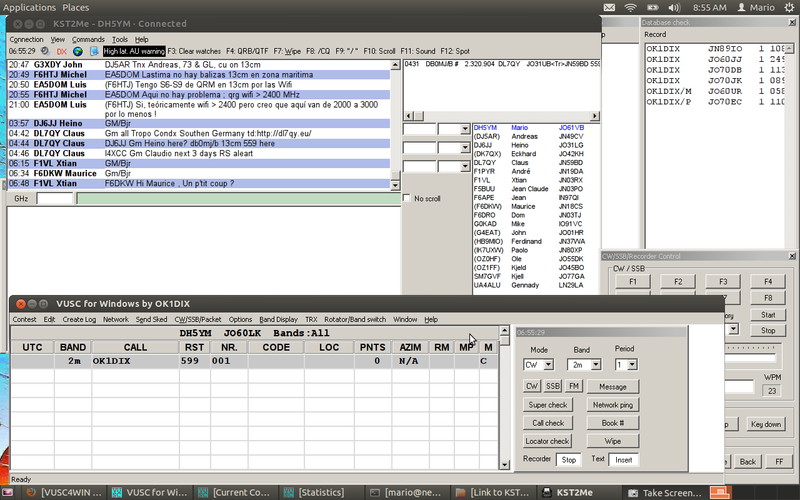 In this case switch off the VUSC internal monitoring tone in the CW/SSB/Packet menue by unselecting “Toggle monitor”. Now the CW from VUSC should be fine.